Hey! What a great day I had yesterday. Thank you guys for joining the Treasured Finds Facebook group. I really didn’t know if you would be interested in the group or not. Happy to say so far we have 70+ members. If you have no idea what I’m talking about there is more info at the bottom of this post. On to the topic of today’s post. Would you buy or have a mirror top coffee table in your home? The JTS bought this one at an auction. 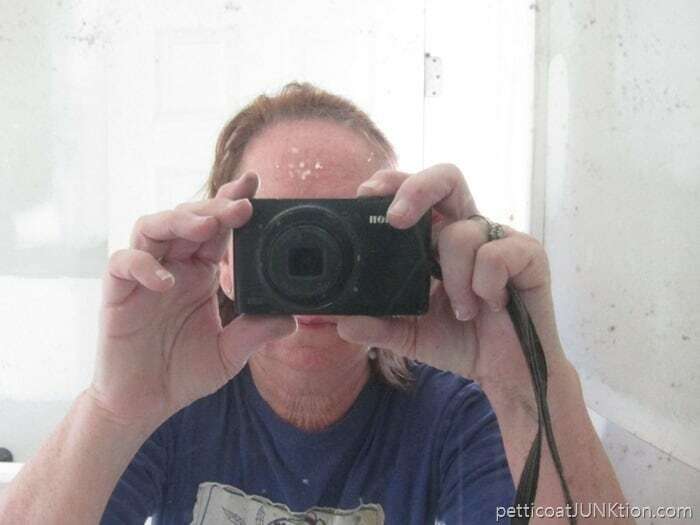 I love the style and I really like the mirror…but it makes me nervous. The JTS and I have almost broken the mirror already. He loaded the table into the backseat of the truck to haul it home. When he hit the brakes the table tilted and the mirror fell out. Yep, it’s not glued down. He didn’t know that and neither did I! I was checking out his purchase in the workshop and tilted the table to look underneath when I realized the mirror had slipped. Yikes. Could have been serious. We don’t need any bad luck and we sure don’t need any cuts caused by broken glass. Needless to say I think I will paint the table top and leave the mirror off. I just have to decide what color to paint the table. I’m thinking basic black. I may try the new FolkArt Milk Paint on it! 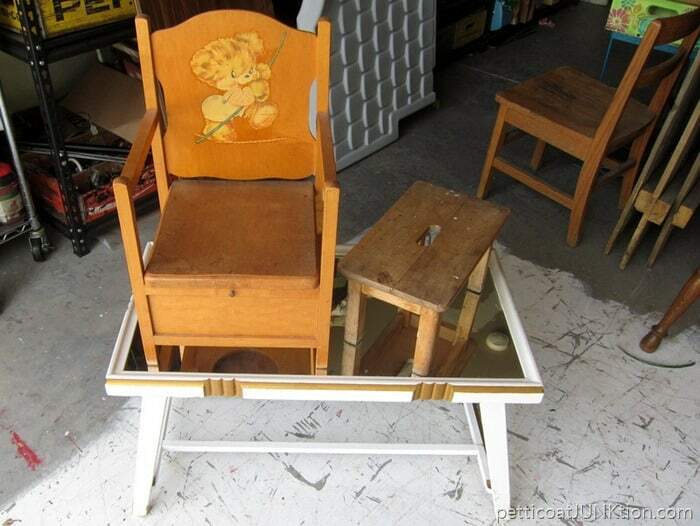 The JTS also bought the little stool and the child’s potty chair at the auction. The seat of the chair has been replaced with wood. I think when the chair is painted it will be darn cute. Someone told hubby that the small stool is for milking goats. Don’t know about that because I’ve never milked a goat. Don’t think I want to either. Next you get a sneak peek at my themed furniture project for Thursday. I have a plan but not sure it’s going to work out. I painted the project yesterday but may repaint it today. Decisions, decisions. Yep, that’s me. Thought I would give you guys a look at the things I get into when painting. I was mixing white paint with water to use as a furniture wash and ended up splashing paint on my hair, face, glasses, and clothes. The paint didn’t hurt the shirt because it has a ton of holes and is already covered with paint. I hate to throw the shirt away because it’s soooo soft. My small point and shoot camera has tiny dots of white spray paint all over it from a prior project. To say things get messy around the workshop is an understatement. Now about the Facebook group. 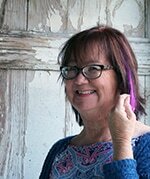 The group is for you guys….my friends….. to share photos of treasured finds, ask questions about projects, get ideas, etc.. You can join the group by clicking here… Facebook Group Treasured Finds …and click the Join Group button on the right side of the header. I will approve you for the group as fast as I can. I have to do it this way to keep spammers out. I had one spammer ask to join the group yesterday. I can usually tell if a Facebook personal page is the real thing or a fake. Hopefully no one slips through. 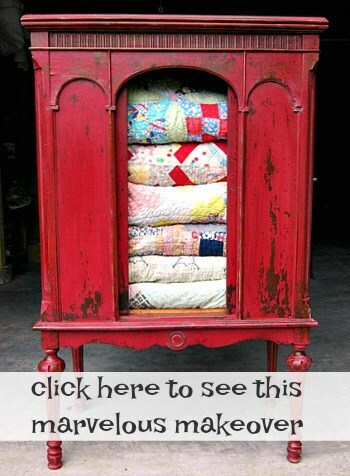 « Do You Want To Share Photos Of Your Junk Finds ? One of my Grandsons fell through a glass topped coffee table and cut his hand severely. He didn’t suffer permanent damage, but I am now totally against glass topped tables. No to mirrored table top – several times my hubby and I have stayed in vacation condos with mirrored tabletops and they are IMPOSSIBLE to keep clean! No matter how often you wipe them down with glass cleaner & microfiber cloth, as soon as you breathe on them they are streaky and messy looking again. Of course, if you create a pretty little vignette on the top you daren’t move an object even a 100th of an inch for that same reason. Mirrored furniture make look good at first glance, but the maintenance is a nightmare! 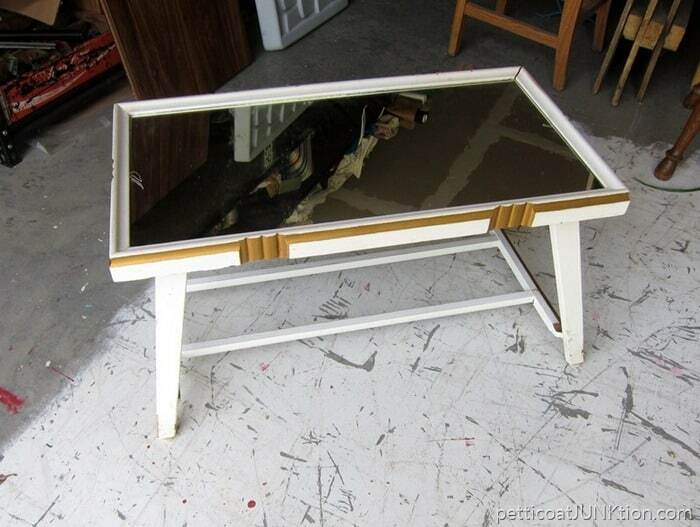 Kathy, I think the mirror goes with the table and would look really cool if you did an acid mirror with a collage. I love doing it my mirrors that have imperfections. You take the paint off the underside of the mirror with a stripper. Wash it off then using a spray bottle you spray muradic acid here and there on the back of the mirror. blot lightly with paper towels or rags. (this takes the silver finish off) you want it to be random looking. ** Make sure to wear thick rubber gloves and safety glasses. Then using Modge Podge you collage pretty papers facing the glass of the mirror onto the glass. Or I usually make the collage on a piece of old poster board cut to fit the mirror. Lay the mirror on top of the collage and see the pretty images come through. It would make a very cool conversation piece! I call them looking glasses. Using the mirror for the table top also eliminates the need for coasters to prevent water stains on wood tops. As long as you have the mirror glued to the top of wood or metal it should be safe and secure. If it should crack you can always grout the crack and make it part of the “look”. I love my mirrored pieces! Normally I don’t like mirror tops, but it does kinda work on your piece. I would antique the mirror on the underside with a silver mercury finish and then glue it down so it would be less likely to shatter. What ever you do, it will be cute. I do not like mirrored tabletops. It can be a dangerous piece around children. Just not a nice look or safe. 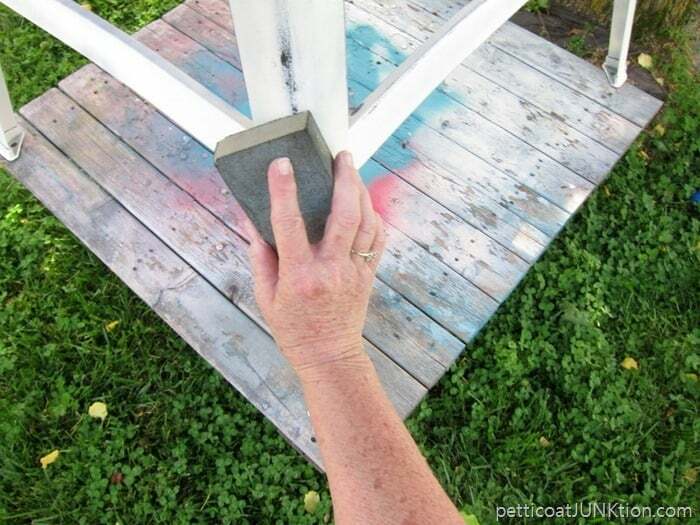 i love the table painted with 2 colors, but would prefer 2 other colors. Sorry I can’t join your FB page. I took myself completely off, didn’t like the owner running the business politically. Hope you keep this site up. Noooo to the mirror table top. That type of glass is not designed for tables and too much of a danger for a serious cut. It’s cute though; so, sure you will find a location/use for it. Looking forward to the FB site. I like the mirror top. It goes with the “retro” design of the table. I’m sure you will find a way to secure it to the table. Hi Kris, If your friend can’t help you send me an email and I’ll guide you through it the best I can. I love your bathrobe story. When we get attached to something it’s for life! That shirt is about 10 years old. I even tried to find one just like it on ebay but no luck. I’m afraid it want last much longer. So glad you joined the group!